We have a saying in our family that either you have the "crafting gene" or you don't. My mom, a quilt designer, teacher and blogger, has it big time. I have it, but it has been lying dormant for years. Recently I found out that Red Heart came out with a reflective yarn, and since I commute by bus and am often walking around on city streets at night, I have been obsessed with getting some reflective stuff to wear. Off to JoAnn Fabrics I went, and I grabbed myself a mix of reflective and non-reflective yarns, and crocheted a scarf! Don't ask me how I made it, because I don't know. I thought I was doing double crochet. But this is the first time in many years that I have crocheted anything, so I think I got my stitches wrong. Anywho, I finished it and it is warm and reflective. The blue/gray yarn is Red Heart Super Tweed in Landshark, and the reflective parts are in Red Heart Reflective in gray. I then went back to JoAnn's and got a huge bag of yarns that I have been making my way through. I made another reflective scarf with Red Heart Reflective in purple along with Bernat Collegiate Chunky in the color Grass Dark Green Dark Purple. In this case, again I can't tell you the exact stitches I used because I thought I was doing double crochet but I might have been doing it wrong. I think I might have been doing double crochet but just in one loop and going back and forth, which gives it the stripey effect. 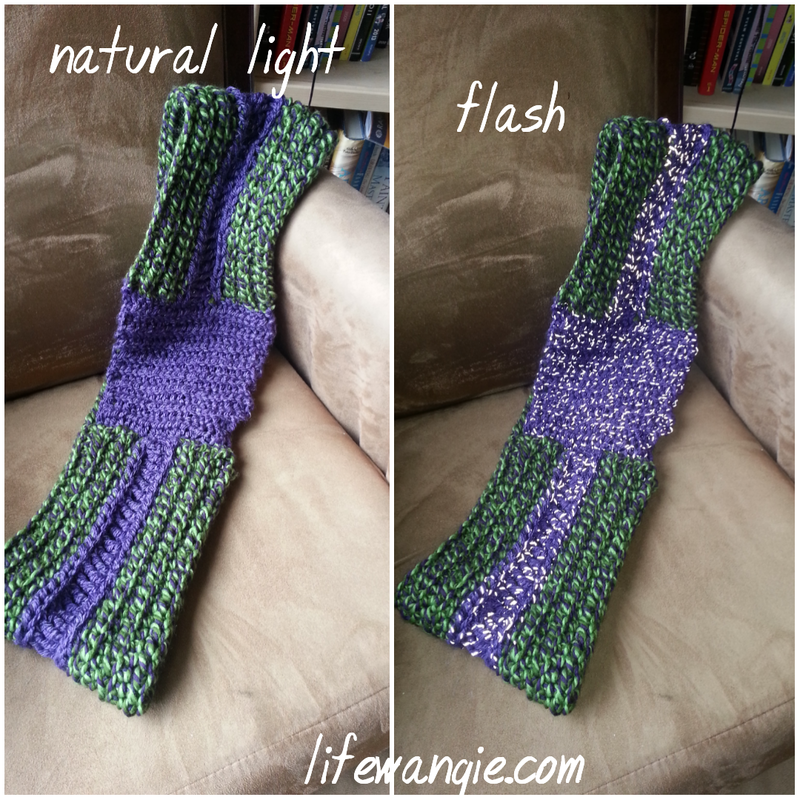 I know the purple stripe has one row of something, one row of triple crochet, and then one more row of something. And then I put in the purple block in the middle because I had a lot of purple left and the scarf wasn't quite long enough. (Patterns? Who needs patterns?) 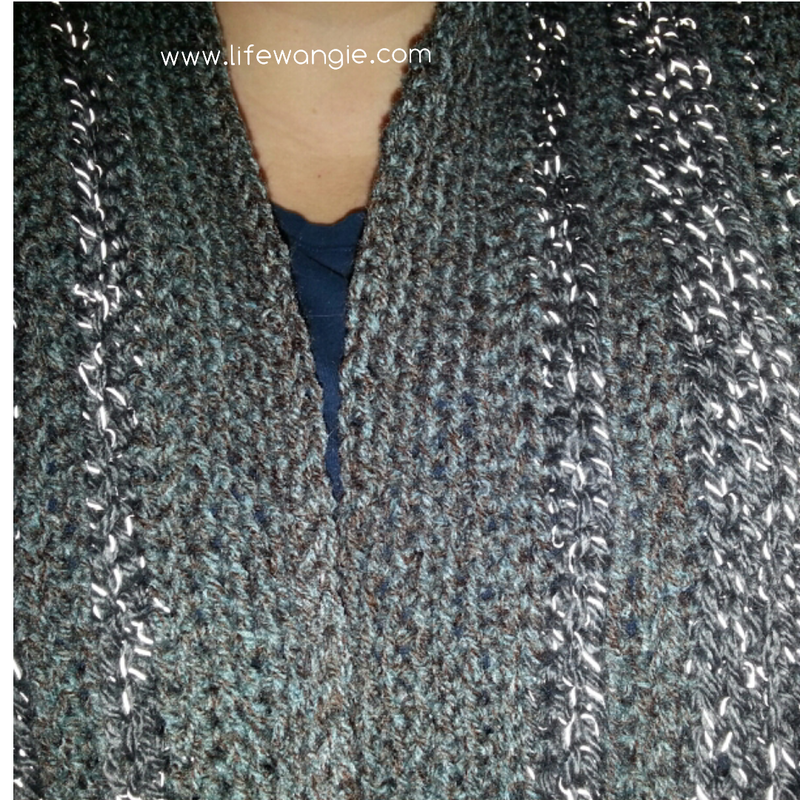 This is a cowl that you can wrap around twice. I'm excited about crochet! I have been working on a couple more projects and will try to post them as I finish them. I also set up a Ravelry profile. Do you do any crafts? Let me know in the comments! You definitely have it! I love these scarves...as long as it turns out even it might not matter what stitches you are using.